The artists in our virtual show create experiential, interactive art using textiles. 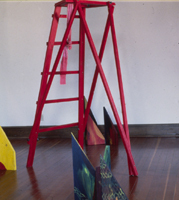 Installations encourage the viewer to fully participate in the conceptual experience. 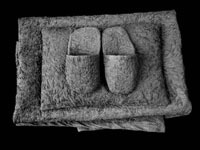 Sound, movement, and the ability to become a part of the work enhance the viewing experience in ways that the static nature of much visual art cannot. We define innovation as work that is new or allows us to see something in a new way. For example, Maggie Orth's supermodern materials combine electronics and textiles to alter the typical performance of fabric. Recently featured in Time Magazine, her work allows us to envision the aesthetics of a future world. Wendy Weiss & Jay Kreimer’s installations combine sound, movement, and industrial materials with traditional weaving. While this type of work is not easy to show on a virtual site, we hope that you will get a sense of their interactive work . Alyce Santoro's invention, "Sonic Fabric," recycles audiocassette tape into an audible textile creating a global bricolage of found sound. 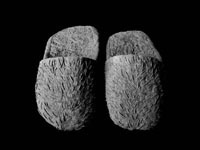 Her low tech, simple woven structures belie the ingenuity of her technologically sophisticated product. Joey Berzowska creates "memory-rich" textiles using conductive yarns and thermochromic inks. 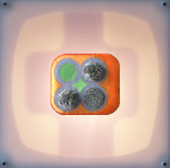 A circuit board may strategically and temporarily remove elements from a weaving in the same way memory can disappear. 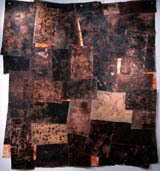 The other artists in the show, Jeannie Mooney, Linda Welker, and Wu Mali are storytellers--they use textiles in their installations to trigger or signify memory, language, landscape or history. 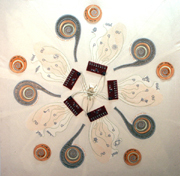 Jeannie Mooney, who now resides in Tasmania also incorporates performance to convey her conceptual message. 28 Aprons symbolizes the 28 years between 1828 and 1856 when more than 15,000 Irish and British girls and women were transported to the Female Factory to serve prison sentences on the island state of Tasmania, Australia. In a similar vein, Wu Mali's installation Stories of Women From Hsinchuang interprets the lives of women textile factory workers. With physical stitches and sounds of the sewing machines, she reenacts history to bring attention to the plight of otherwise invisible women living within the strict Chinese patriarchal system. And finally, Linda Welker floats panels of graceful text in a serene, formal environment. Her austere and pristine installations transform calligraphic marks into mysterious and elegant patterns alluding to memory and knowledge. 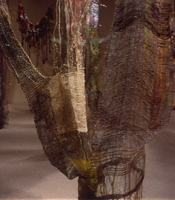 As you peruse the work in this show, use your imagination to think about rustling sounds, subtle movement of fabric, color changing through heat, textiles that speak and of course, the physical presence of cloth. We hope this glimpse will encourage you further experience textile installations. If you'll be in the San Francisco Bay Area, please visit our parallel show at the San Francisco Museum of Craft + Design, February 17, 2006 to May 28, 2006. Conductive yarns, traditional light fixtures, plexi-glass, incandescent light bulbs, theater gels, and wood. The interactive FUZZY LIGHT WALL is a grid of 15 fuzzy capacitative sensors that when touched, dim on and off lights and illuminate colorful shapes behind plexi-glass. Cotton, rayon, and conductive yarns, thermochromic ink, electronic components, and drive electronics. LEAPING LINES is a jacquard woven color-change fabric, printed with thermochromic inks which are electronically controllable. cotton, rayon, and conductive yarns, thermochromic ink, electronic components, drive electronics, and software. DYNAMIC DOUBLE WEAVE is a hand woven color-change fabric, electronically controllable textile, printed with thermochromic ink. Fuzzy pompom sensor on decorative fabric face plate, attached to a traditional household dimmer. Squeeze pompom for lighting control. This color-change textile artwork was created for a private client by commission. This piece is hand woven and hand printed with over 150 hand mixed colors. It contains 64 unique color change areas. The expressive software for this piece is pseudo-random; it turns on 16 random color-change areas (pixels) at a time. 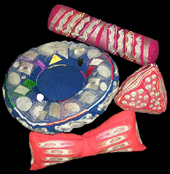 These works in electronic embroidery were created as musical instruments for Tod Machover’s “Toy symphony”. Each instrument contained eight embroidery pressure sensors which were used to control music software on a full sized PC and various MIDI instruments. The Electronic Table Cloth was created to allow guests at a fundraising event to playfully communicate personal information by touching the tablecloth. Each tablecloth contains a decorative embroidered tag-reader and a decorative embroidered keypad. At the event these electronic textiles were connected to a large computer and data base. 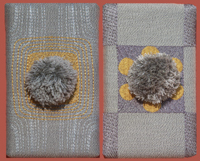 Today, these textiles are inactive wall pieces. A series of 6 tablecloths exists. Triangles is an interactive art kit designed to explore interactive sounds, images, and stories by connecting individual networked electronic pieces. 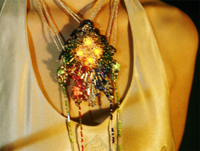 The Firefly Dress and Necklace is an early integration of fashion, electronics, and electronic textiles. 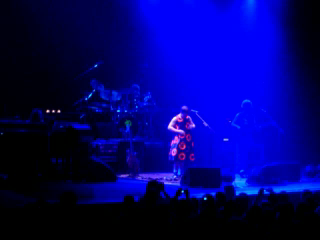 The dress and necklace are hand sewn electrical circuits. The movement of the wearer causes the circuit to complete itself and the lights in the skirt and the necklace to flicker and change color. 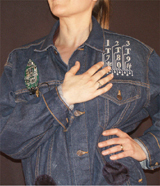 The Musical Jacket intergrated a wearable MIDI synthesizer with an embroidered fabric keypad. The wearer can play notes and create rhythms and sounds. The jacket is one of fifty multiples. Nylon monofilament, wire, linen, cotton and silk thread, electronic sound triggered by the viewer. 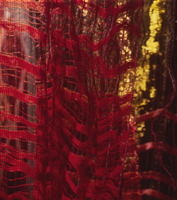 Handwoven textiles created as a performance space for dancer and choreographer Joan Stone. 4 wood towers, hinged moveable floor sculptures, egg tempera paint and suspended net of raffia, linen, rayon and mohair. each panel is 96" x 50"